Line 1 lists the incomes of both the receiving parent and paying parent, and Line 1a lists any maintenance they may be receiving. It’s important to note that sometimes the court will impute income to one party if he or she has been proven capable of making a higher income then he or she is currently earning. Line 2 allows for adjustments to be made if children other than those of the parties are also being supported by one of the parents listed on the Form 14. There are some restrictions on when such adjustments may be made, and an experienced family law attorney should be consulted to determine whether said adjustments are applicable to your case. Line 3 is an automatic calculation based off of Lines 1 and 2 which lists each party’s adjusted monthly gross income. Line 4 is a percentage automatically calculated based on each party’s income in relation to the total amount earned by the parents as a unit. Line 5 is an amount which is taken from the Missouri Schedule of Basic Child Support Obligations, which is a chart based on the incomes of the parties and the amount of children to be supported. Line 6 accounts for the additional child-rearing costs the parents may have for the children. Lines 6a and 6b are where any daycare expenses of the children are listed. If a parent is paying for these, then he or she receives credit towards the support number. The same goes with Lines 6b-6e, which acknowledge health insurance costs, other extraordinary medical costs (such as medication for a recurring ailment or health issue), and other extraordinary child-rearing costs (such as an extracurricular activity or private school). Line 7 lists the accumulation of additional child-rearing costs paid for by each parent. Line 8 lists the total amount of child support necessary to adequately care for the children, and is a combination of both the Line 5 charted Missouri basic child support obligation and the Line 7 additional child-rearing costs. Line 9 takes the Line 8 amount of child support and attributes it to each parent per the percentage stated in Line 4. Line 10 specially gives credit for any additional child-rearing costs being paid by the paying parent which are not otherwise acknowledged in the Form 14 thus far. Line 11 gives the paying parent a credit for the percentage of overnights the children spend in his or her custody per year. Thus, the higher the percentage, the lower the child support amount owed to the receiving parent. 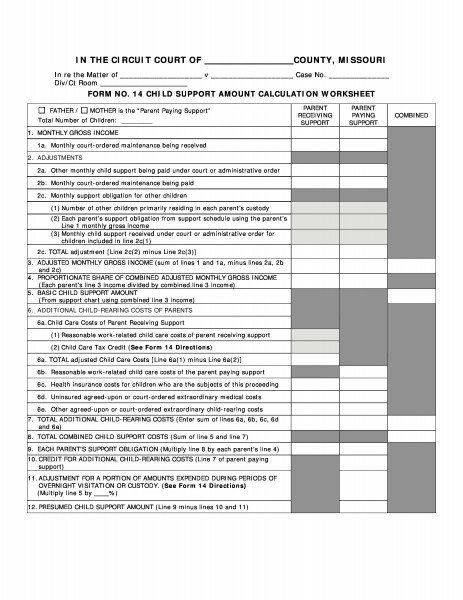 Line 12 is the final product of the Form 14, and lists what the presumed child support amount should be, i.e. what the paying parent should pay the receiving parent. As you can see, the calculation of child support in Missouri can be a tedious process as there are several different considerations in the determination, so it is vital that an experienced family law attorney is consulted when you are determining child support in your case. For a explanation of your options in receiving or paying child support in Missouri, please see our prior post.